It’s hard to believe another week has rolled around. 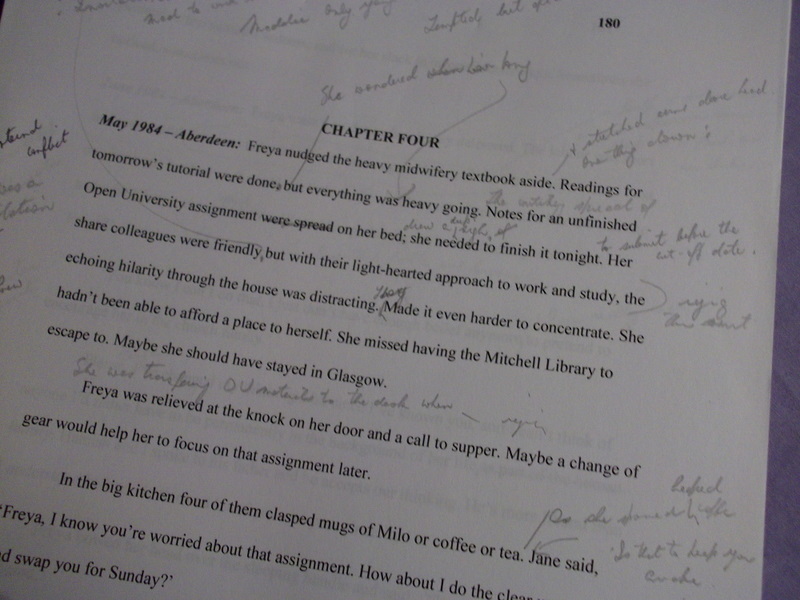 Today – 30 April: Very focused on editing, and worked pretty well straight through 20 chapters. I’m hoping that means enough work had been done on earlier sweeps and not that I’m missing something now; not still too close to see the flaws. All changes were fairly superficial – of the tweaking variety. When I’m done, I guess that means the manuscript is ready for some wider opinions – beyond the Writer’s Group and my own. Hoping to finish and format by 5 May. Over the lunch period I critiqued a draft short story in memoir form for a Group member. Aren’t other people’s lives fascinating? Usually we don’t get under the surface for casual friends unless through memoirs and the guesses we make from reading their fiction. More critiquing to come before our May meeting on Friday. Weekend editing – 28-29 April: In fits and starts. Many interruptions. Cursory scan of two chapters only. Disappointed as it means I missed the April 30 Part One deadline for completion. Still it feels better to have a goal than not, and I don’t think I’ll be too far behind. Weekend reading: Somehow I got distracted and read very little for a change. Am still with the Collins the keepers of truth. While still enjoying the writing if not the story, I admit to finding the visions of the industrialisation impacts somewhat repetitive. Am about four fifths through and I got the message quite a while back, unless something new crops up to prove it all needed to be said over and again.